The new Adult Centre at Up with Downs was officially opened on Friday 25 November with the Mayor of George and a great representation of the George community present. 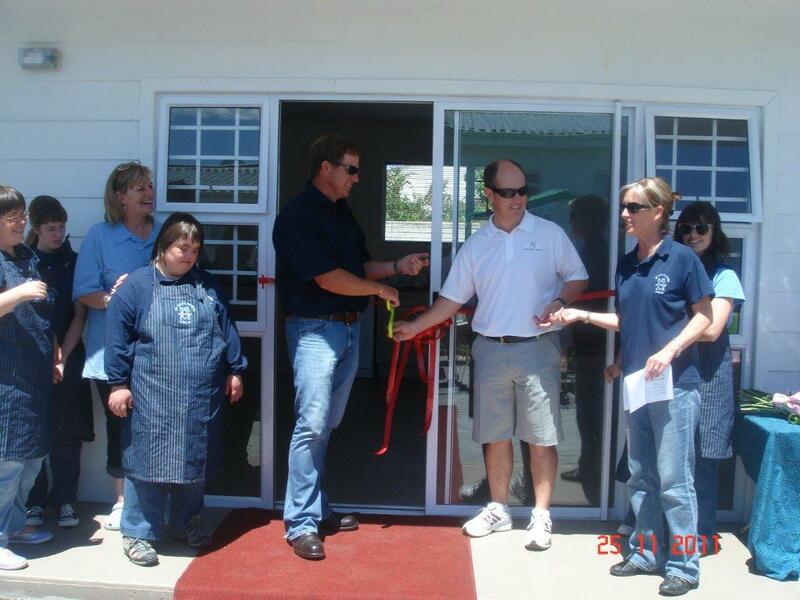 This facility, which was generously sponsored by several local businessmen, will present young adults with Special Needs the opportunity to learn life skills in a workshop environment and perhaps even move on to sheltered employment within the community. At present there are 5 learners enrolled at the Centre who have been, for the past 6 months participating in the running of the laundry at The Town Lodge once a week. “This has been a remarkable experience for us, as these young Adults are seeing what it takes to work in the outside world, and we truly thank the management and staff of Town Lodge” says Janet Seegmuller, Chairperson of Up with Downs. “Next year it is our hope that more local businesses will provide the opportunity for these learners to work towards some kind of sheltered employment”. At the opening in November 2011, the theme ‘EVERYONE IS DIFFERENT BUT EQUALLY IMPORTANT, was a reminder that youngsters with special needs also deserve the chance to feel not only a part of this society, but an important and productive part of it. The Open day saw a cross section of people popping in for a visit and a cup of tea. The learners and staff had been busy working towards the school’s very first ‘market day’ where fresh produce from their own vegetable garden, biscuits and cookies made by the learners and arts and crafts were on sale to the visitors. Hopefully this will become an annual event which everyone can look forward to in the future. For learners with Special Needs, Up with Downs now offers a morning school program with aftercare, a morning adult program in the Adult Centre, an afternoon life skills program for the seniors and adults, as well as a hostel facility for those who live out of town. The aim is to keep classes small enough so that each individual receives the best tuition possible. The hostel offers a ‘Home away from home’ environment and the learners there form part of one big happy family! For any information on Up with Downs, or to find out how you can help, please contact Polly at the office during school hours on 044 870 8770.